Zaha Hadid has created a unique chamber music hall specially designed to house for solo performances of the exquisite music of Johann Sebastian Bach. The Chamber Music Hall has been installed within Manchester Art Gallery for the duration of the Manchester International Festival 2009. A voluminous ribbon swirls within the room, carving out a spatial and visual response to the intricate relationships of Bach’s harmonies. 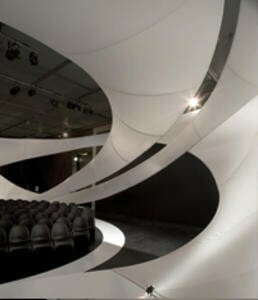 As the ribbon careens above the performer, cascades onto the ground and wraps itself around the audience, the original room as a box is sculpted into fluid spaces swelling, merging, and slipping through one another. The ribbon itself consists of a translucent PVC fabric membrane articulated by an internal steel structure suspended from the ceiling. The surface of the fabric shell undulates in a constant but changing rhythm as it is stretched over the internal structure. The design process involved architectural considerations of scale, structure and acoustics to realize a dynamic formal dialogue inseparable from its intended purpose as an intimate chamber music hall. A layering of spaces and functions is achieved through the ribbon wrapping around itself, alternately compressing to the size of a handrail then stretching to enclose the full height of the room. Circulatory and visual connections are continually discovered as one passes through the multiple layers of space delineated by the ribbon.